You can’t buy HAPPINESS but you just might get it for FREE! We believe we can all feel MORE ABUNDANT when we share our skills and knowledge. We believe each of us has valuable resources to offer. Sharing is a way to live more sustainable lives because when we share we reuse resources and avoid consuming new ones. ShareFest Honolulu is a powerful way to encourage the sharing movement with interactive booths that embody sharing values. Come be transformed by participating in a day-long experience of sharing! By freely sharing our talents and resources together we will strengthen our community ohana. ShareFests are being encouraged and supported all over the world by Shareable, an online hub for the sharing transformation. What to bring to ShareFest Honolulu: This is an interactive event with lots of opportunities to share! Our suggestions: Bring an old favorite T-shirt to Upcycle at our Sewing Station. Bring a Book, Toy, and/or Game to leave on our Swap Tables. Bring Seeds and/or Plants to Exchange. If you can, bring a healthy dish or snack to share with the Community Potluck – and remember to bring your own plate/utensils/cup so we can keep ShareFest as waste-free as possible! How to get to ShareFest Honolulu: Directions, Bus info, parking suggestions and map, all found HERE. The Sharing Economy: ShareFest Honolulu is inspired by the sharing economy movement sweeping the globe (also referred to as the peer-to-peer or collaborative economy) which seeks to build a socio-economic system around the sharing of human and physical resources. The sharing economy represents a solution to worldwide resource depletion and can create new models for the development of wealth. Current examples of this model in the marketplace are: Craigslist, ride sharing (Uber or Lyft), AirBnB, bike sharing, etc. The sharing economy provides both access to things you do not own as well as a means to use the excess you already own. ShareFest Honolulu will bring together organizations and people interested in exploring a sharing economy so they can engage, network, and creatively envision alternative ways to get our needs met without always having to rely on money as a means of exchange. Positive Media Hawaii’s Trash-to-Treasure Sewing Studio: We will help you Upcycle your old t-shirts into something new and unique. Look through our catalog of ideas and makeover your old tees into tanks, racer backs, add ruffled collars… or make a bag or a pillow! We want to help people have a direct experience turning their trash into treasure using the tools and skills of creative sewing. Are you a sewer with skills to share? Come be a ReFashionista Mentor and help folks through the process, contact us for more info. Tasty and Meatless Pop-Up: Offering free vegan food samples and healthy cooking demos. Food donated for us to share from these amazing sponsors: VegFund, which provides grants to vegan activists to support their efforts to inspire people; and Down to Earth Natural Foods who is helping Hawaii Love Life! For more things Tasty and Meatless, visit here. Transition Oahu: Oahu’s local Transition group, helping build community resilience as our society faces challenges in the energy, climate, and financial spheres. Learn more about our grassroots work to raise awareness and “plant seeds of resilience islandwide.” We will provide an opportunity to express solidarity with those taking part in the following day’s People’s Climate March in New York City. 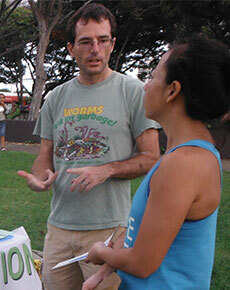 Oahu TimeBank: Learn about TimeBanking and how to set up your profile on the local website. The Oahu TimeBank allows us to exchange resources and fill needs locally without spending money. For every hour that you help a neighbor you earn a time credit which can be redeemed for services in a never-ending cycle of sharing. Seed and Plant Exchange: Permablitz Hawaii brings the edible garden revolution to ShareFest with a Seed and Plant Exchange. Bring seeds or cuttings from your garden and help build Hawaii’s food capacity one backyard at a time. ShareFest Swap: Books • Toys • Games: Clean out your closets and bring your treasures to ShareFest. We will have three different SWAP tables dedicated to BOOKS, TOYS and GAMES. Bring something you’ve already enjoyed and take something new! Sustainable UH: Our hosts at UH Sustainability Courtyard, this eco group is helping establish the UH System to be a world leader in sustainable education, research and practices. Box Jelly: Co-working curious? Stop by a special BoxJelly “satellite location” at ShareFest and learn about sharing office space and tools with other entrepreneurs on a membership basis. Pull up a chair and — if the programmer is in — learn a bit about programming from Joe Heaukulani! Free Bike Repair: Cycle Manoa is 100% volunteers dedicated to promoting and enabling bicycling. They offer free repair assistance to the community, restore donated bikes and put them back into circulation, and do advocacy. So bike down to ShareFest and hang out with this cool crew! Basket Weaving Demo: Gaye Chan is a conceptual artist whose works can be seen in galleries, on the web and in the streets. She is well known for her project, Eating In Public, who looks for ways to create systems of exchange outside the capitalist structures. She brings her Barter Basket project to ShareFest where she applies traditional basket weaving techniques to upcycle mounds of discarded shipping box straps into beautiful and functional baskets. Gaye will only be doing the demo between 11:30am – 1:30pm. Flutterbye Butterflies with The Green House: Madame Butterfly will be on hand as we learn how to help our endangered pollinators, get up close and personal with caterpillars, explore the importance of butterflies as beneficial insects and get our hands dirty making “seed balls” to start a pollinator garden of our own! This activity is available 1:30 p.m. – 4 p.m. and is presented by The Green House Center for Sustainability. The Outdoor Circle: Volunteers working together to protect Hawaii’s public commons and scenic vistas by planting and protecting trees, promoting responsible development, and supporting a clean and healthy environment for all people. Learn how you can help keep Hawaii clean, green, and beautiful! LoNo Transpo: Hawaii’s alternative, eco-friendly car rental company. Their rejuvenated vehicles run on waste vegetable oil (WVO) obtained from local restaurants. Learn more and check out one of their early 80s Mercedes available for rent. UH Community Engagement: Since 1994, UH Manoa’s Service Learning Program has worked with students, faculty, and members of the community. The SLP provides students with the opportunity to volunteer in their community in meaningful ways while furthering their education. Honolulu Neighborhood Commission: The only government-supported civic engagement system in the State of Hawaii, this office was created to increase community participation in government decisions that affect them. Learn how you can help establish the goals, objectives, and priorities of your neighborhood by joining your Neighborhood Board. Share Peace – Origami Crane Folding: After swapping some toys and games at the swap tables, learn how to fold a paper crane with Penny! You can keep your cranes or add them to a collection to send to Japan in an expression of peace. Peace Day Hawaii and International Peace Day is September 21. All ages are welcome to fold cranes! Live Painting: Maria Cristina Guerriero is a self-taught artist who uses art as a healing tool therapeutically in her work teaching student nurses complementary and alternative medicine at UH. At ShareFest, she will live paint a blank canvas reflecting the energy and good vibes we generate at the festival. Come watch as it unfolds! She will also offer an interactive station to make your own Affirmation Cards! Skills Share Booth: We are all teachers. We are all students. Contact us to schedule your 30 minute time slot at ShareFest! 12:00pm – 12:50pm Acroyoga 101 with Lealyn and Javier Learn 5 fun and exciting partner yoga/balance moves that build strength, flexibility and trust! Come alone or with a partner. No yoga experience necessary but bases should have strong legs and flexible hamstrings. Flyers need only be willing to trust their base. All fitness levels welcome but please do not participate if you have a back or neck injury. Great for adults and kids! 1:45pm – 2:30pm Reflexology Come learn reflexology, a non-invasive, complementary modality that involves the application of an appropriate amount of pressure using thumbs and fingers on specific points of the feet, hands and ears affecting the whole body. Taught by members of the Reflexology Association of Hawaii – sharing the healing touch throughout the islands. 2:30pm – 4:00pm Building with Bamboo In this workshop, we will build a simple bamboo stardome with Julia Teles of Brazil. All people are welcome to come and help and learn a bit about this structure, about bamboo and the lashing.Julia is a PhD student doing and exchange at the UH School of Architecture. She’s interested in construction that can be done with natural materials with people working together and sharing skills. Want to say I love you and what you do …lovely sunshine picture ! jim the botanical oasis is shinning with new ethno-botanical garden plans afoot! I have two ideas/skills I like sharing, if you think they would be of use…? workshop on that, I have safe practice gear for up to 8 at a time. empower them in their political system. Can you let me know if any of these would be appreciated? Love your ideas, Darin! I will get in touch with you directly. I really liked the idea of Share Fest and I would like to help! I’m a PhD student from Brazil and I study sustainable design, and I’m doing an exchange at UH. Is it possible for me to help in the T-Shirt ReFashion Booth? And is it possible to propose a workshop? Julia, would LOVE to have you as a ReFashionista mentor at the Sewing Station. I will get in touch with you directly. Thanks for your enthusiasm about ShareFest Honolulu.